Camp Activity by Outdoor Laser Tag, USA - Leading provider of Mobile Laser Tag for Birthday Parties, Camps and Corporate Events! We operate a camp like you and we understand the importance of scheduling and hiring high quality, trusted vendors and always deliver a fun, premier event. 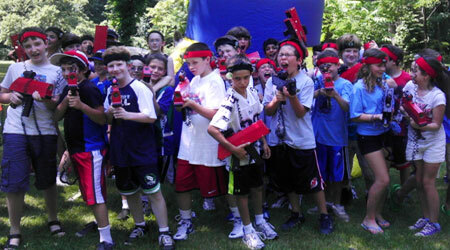 Outdoor Laser Tag is a unique action-filled, all inclusive activity to supplement traditional camp programming and is the "Perfect Camp Activity". Campers aged 7 and up can safely participate and have unlimited fun when you add this program to your Special Events calendar. This is turn-key booking for Camp Directors. We arrive at your camp and will be up and ready in less than an hour. Camps do not need wooded areas since we come with everything needed to set-up a mission field or fields starting in size from 1/2 a basketball court up to an entire football field to allow up to 150 participants to play several games each hour. Our staff will equip the campers in a matter of minutes and play a variety of mission games that work with campers of all ages. Our "state of the art" equipment can be used in anytime of day in bright sunlight or complete darkness, outside or inside. Outdoor Laser Tag is also a great team-building activity. What better way to get everyone up and moving during your staff training? This is also a great way to bring the staff together as a team during the 2nd or 3rd week of camp or as a staff appreciation event at the end of the camp season or between sessions. Outdoor Laser Tag is a great way to break color war! This is just one of several scenarios that we can come up with together to break Color War at your camp. Not only do you break color war but the campers participate in a great activity as part of the break that is unique and allows them to live out their fantasies. 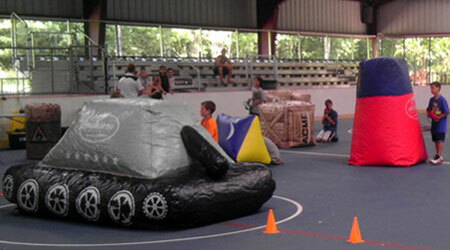 Pricing is based on the amount of laser tag play time for each player and can be adjusted to meet any budget. A typical medium-sized camp with between 250-300 campers will need 40 lasers for 4 hours for each camper to play during a typical camp period of 40 minutes at a cost less than $10 per player! 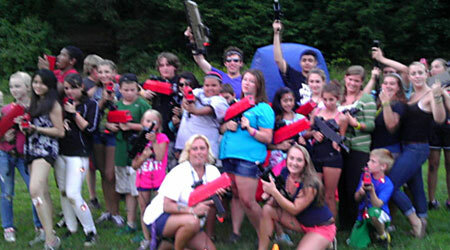 *We have the largest selection of laser tag equipment, with 125 lasers that can be booked for your event. Email Andrew or call for a quote on booking more than 50 lasers. We can also set up 2 or 3 fields to accommodate larger camp groups. You can also book a field trip and come to our state-of-the-art Outdoor Laser Tag Mission Field at our camp at Black Bear Lake in Clarksburg, NJ. 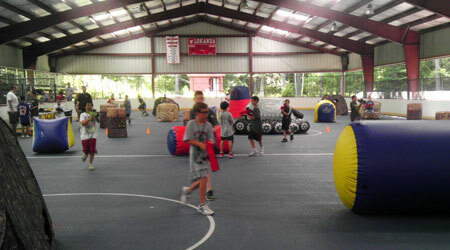 We create your mission field on your camp property using inflatable barrels, tanks and barriers of different sizes and shapes and camouflage forts to create a unique, customizable mission field of play and music.